Graded NM-MT 8 by PSA. Hall of Famer, and a scarcer "High Number" entry. Among more than 1,600 copies recorded in PSA’s census reporting, just ten examples have been graded higher. Presented is a bright representative of Mickey Mantle's "true" rookie card. 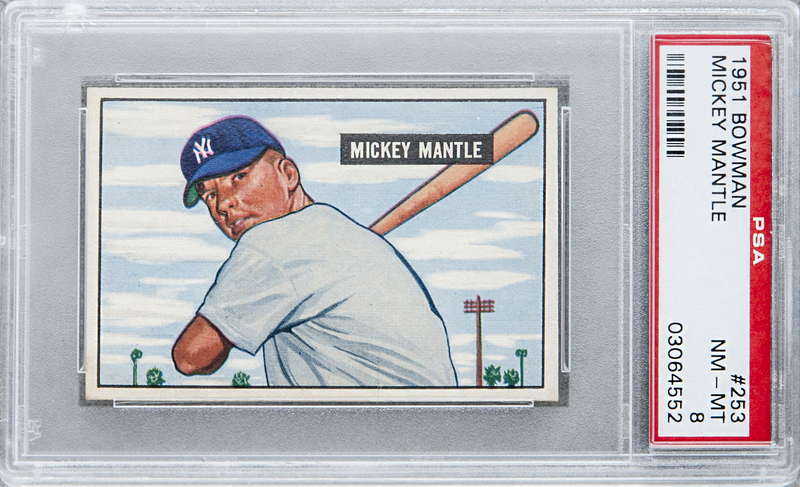 This specimen of Mickey Mantle's rookie card will forever eliminate the need to upgrade a top-quality collection. A hobbyist will gaze at this scarce piece, sigh with satisfaction, and move on in the attempt to find other high numbers for the set that measure up to this one. Mickey Mantle is still considered by many to be the last baseball hero. The young outfielder accepted the torch passed by the great Joe DiMaggio, who had similarly followed in the path of Lou Gehrig. 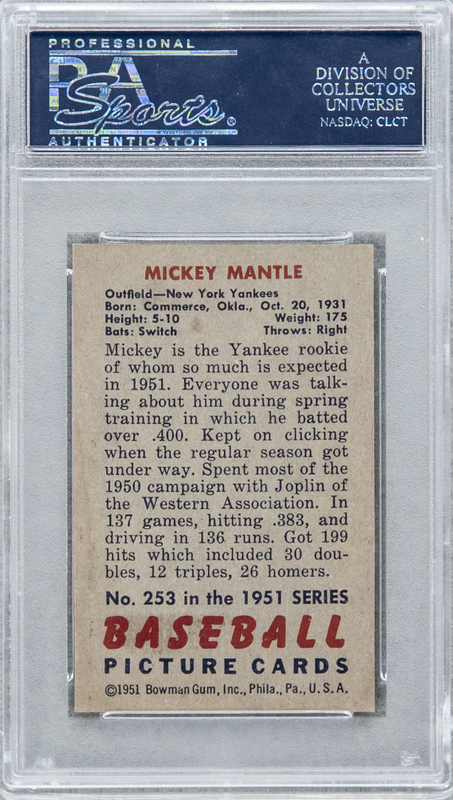 The 1951 season was Mantle's first in pinstripes and, despite his being sent back down to the minors for more seasoning, Bowman issued this card in that year's final, key series. Bowman's initial vision of future greatness is wonderfully captured on this mini-artwork, rendered as a horizontal image set against the brightest of skies. Only in the most carefully preserved specimens, such as the one here offered, does the design's inherent magnificence reveal itself. This example delivers a clean surface, and additionally features superb white borders that culminate in four sharp corners. The card exhibits tremendous visual appeal with bold colors and a full, uninterrupted image. It has escaped the printing inconsistencies that characterize the issue and which make "clear" examples, like this one, so very special. The reverse is perfectly centered and unblemished. Superb Near Mint to Mint condition. Auction closed on Sunday, October 2, 2016.